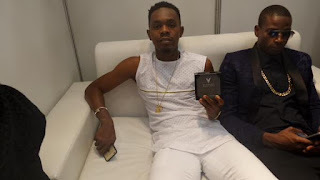 Winners and performers who attended the just concluded MTV Africa Music Awards KwaZulu-Natalwere presented with a classic timepiece from Vintage Concepts worth a cool N500,000. The MTV Africa Music Awards 2015, brought to you by KwaZulu-Natal Province in association withAbsolut Vodka and in partnership with The City of Durban, took place at the Durban International Convention Centre (ICC), KwaZulu-Natal, South Africa on Saturday 18 July 2015. Performers at the hit show, including Seyi Shay, 2Face, Bucie, Sauti Sol, Yemi Alade, K.O., P-Square, DJ Fisherman, NaakmusiQ, DJ Tira, Anselmo Ralph, Big Nuz, Duncan, Burna Boy, Stonebwoy, Da LES, Diamond, Flavour, Toofan, D’Banj, Davido, Uhuru, Black Motion and Cassper Nyovest, were also presented with a limited edition case of Absolut Vodka. Some of the performers have already taken to social media to name-check the watches, includingBest New Act winner, Patoranking, and awards host, Anthony Anderson.